Sometimes products hit my desk that inspire and motivate me to be a more creative, educated and in tune with my kids. They make me want to be a better mom - but take the easiest route to get there. 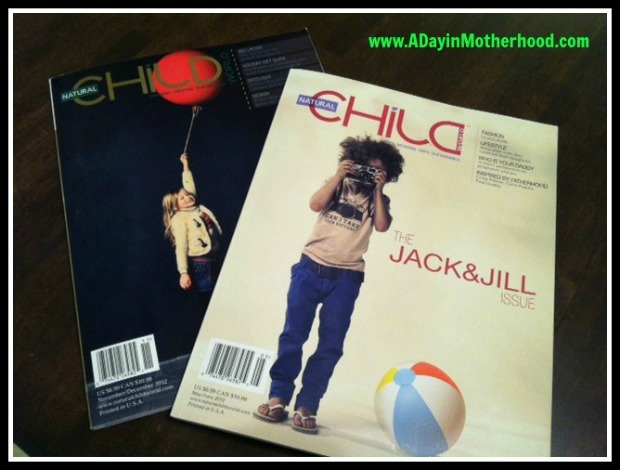 I am recently inspired but the beautifully published magazine, Natural Child World! Simply put, this magazine is just cool. It is hip and trendy and something I think all moms are going to love flipping through. The sections are interesting, educational and inspiring! It only took getting the magazine in the mail to know I was in for a treat. These are not your typical parenting magazines. They are clearly well thought out and the articles presented are current. Articles like "Mighty Milk" - a very interesting and educational article about breastfeeding - and "Choosing Non Toxic Toys". The December issue even had a great article about "How Disney Creates Happiness for the Next Generation". But what I like about this magazine is that is it about more than the kids. There are useful articles aimed at moms and dads! There is a section on their May/ June 2012 issue that is "Inspired by Fatherhood. : Dads Who Are Changing the Rules". It is a candid question and answer with the dad who started a company inspired by his daughter. Add to the magazine aimed at raising children in a more natural, green environment products, great sections on the latest toys, clothing and items for mom and dad and you have a complete, fun, educational magazine that will make you think every time you pick it up. If you are looking to raise your kids with more sustainable products and a more natural way, this magazine is for you. If you want to read smart articles that are current and well written, this magazine is for you. If you want to be a modern mom, this magazine is for you! So go online and request your FREE SAMPLE and to get your subscription or pick up a copy at Whole Foods, Barnes and Noble and other retailers! Joining Natural Child World Magazine to help your kids live a more natural and healthy life, Copy-Kids is the DVD for any parent who wants to motivate their kids to eat fruits and vegetables! I have this DVD, and have for a while, and fully credit it with the fact that my 3 year old prefers broccoli as a snack. The DVD shows kids eating a variety of fruits and vegetables and captivates my kids every time. I am not sure what it is, but I am sure the fact that KIDS are showing kids what is good versus mommy begging them to try it is the key! You can pick up your copy of Copy-Kids now! To help celebrate a more healthy lifestyle and the two products listed above that are aimed at that, they are joining together to offer (1) of our readers an awesome prize pack! I like that there are articles geared to kids and parents and that the focus is on a cleaner and healthier lifestyle. I'm excited about the revelations about alternative and modern parenting strategies. It also looks like they feature some great innovative products. I would need something like this. I have no idea where to get started in that natural parenting world. I love their highlights on the website, like fashion, spotlight and behind the label. I would love to know what is behind the labels! I'm excited to read another parent/kid related article source.